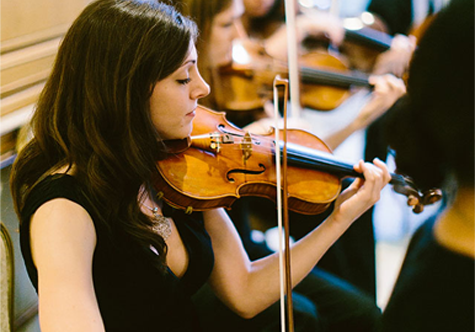 We offer exquisite performances by string players, harpists and flutists as soloists or ensembles. With more than 10 years of experience in providing exquisite music, Miss Musique guarantees that we will create the perfect ambiance for your event. Get a taste of the audible ambiance Miss Musique’s musicians bring to your events. Our on-site videos allow you to grasp the essence of our service. Increase your income and performance opportunities by being associated with an established and well-respected organization. Exquisite custom performances by seasoned local musicians. View performance videos to sample our musical experience. We are looking for talented local musicians to join Miss Musique. Inquire today! Available for weddings, corporate events, religious events, private parties and more, Miss Musique offers your event the most talented and experienced professional musicians in Philadelphia. We are looking for contract musicians! All qualified violinists, violists, cellists, harpists and flutists should submit an application for association with Miss Musique. Miss Musique’s top-notch musicians can perform thousands of songs to suit your tastes. We can entertain your guests with upbeat party music at a cocktail hour, up the romance at your wedding ceremony with elegant classical music, or impress loved ones with their favorite song turned acoustic! 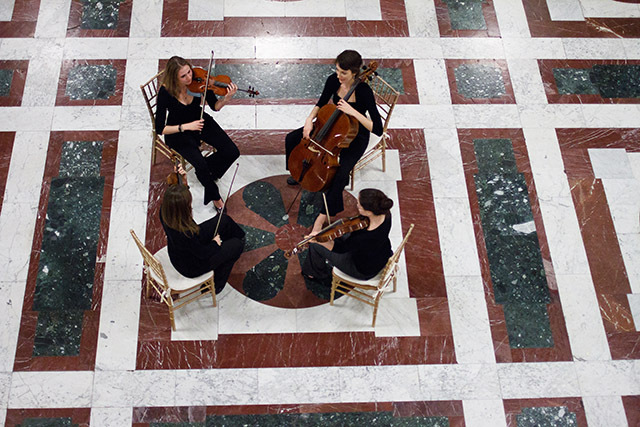 Our Philadelphia string quartet can add an extra touch of elegance to any event. Miss Musique was established in 2011 to provide live musical entertainment in classical, pop, and religious musical genres. We perform throughout the Philadelphia PA area and all surrounding regions, including New York, New Jersey, Delaware and Maryland. We have performed in weddings, corporate events, religious events, private parties, and more. 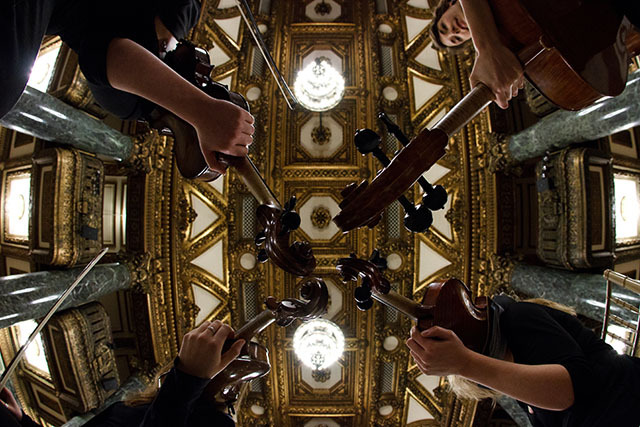 Hear the difference with Miss Musique's string quartet Philadelphia! Our musicians hail from some of the finest conservatories in the US and abroad. You can find Miss Musique’s Philadelphia quartet musicians performing in many of the professional musical groups in Philly. 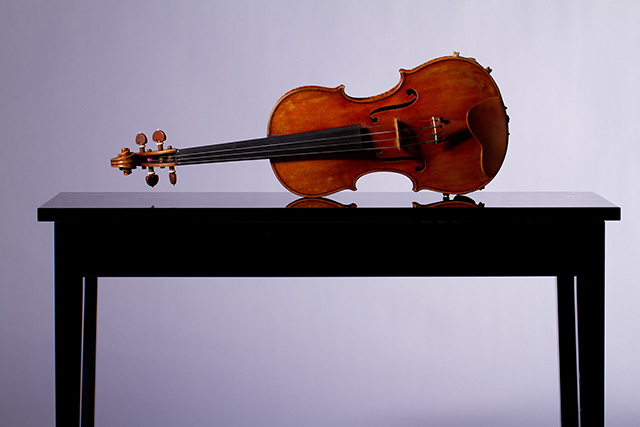 Miss Musique string ensembles include a Philadelphia string quartet (two violins - viola and cello) a string trio (violin, viola, and cello) a string duo (violin and cello) and a violin soloist. We can add any type of Philadelphia wedding musicians that can play any instrument that suits your tastes. We routinely perform at wedding celebrations, cocktail parties, educational events, religious events (e.g., bar/bat mitzvahs), corporate events, and memorial services. Miss Musique musicians have dazzled audiences with their talents in many different professional performing arts and event venues: from concert halls such as Philadelphia’s Kimmel Center and New York City’s Carnegie Hall to Philadelphia’s Moshulu and Union League, in numerous popular wedding venues including Union Trust, Tendenza, The Ballroom at the Ben, and La Croix at the Rittenhouse Hotel. Philadelphia string quartet weddings are better with Miss Musique! Miss Musique’s Bose sound equipment can easily handle outdoor and events of a substantial size by creating an experience tailored to your needs and budget– our elegant string quartet Philadelphia PA will be perfect in any performance scenario. 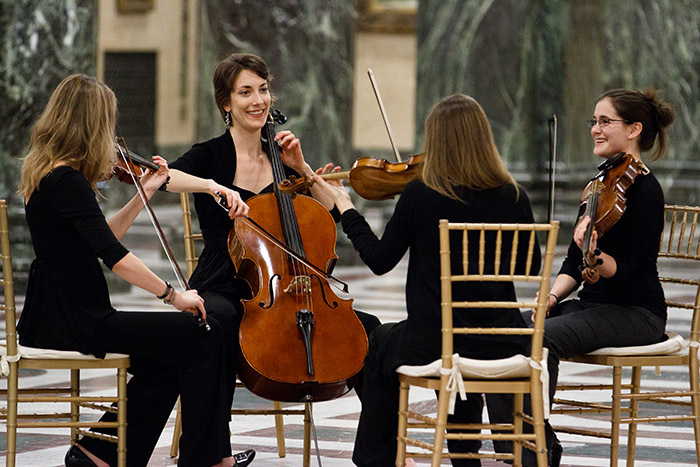 Many clients have selected Miss Musique to perform at their events based on finding the best Philadelphia string quartet cost. Miss Musique is a five-time Best of the Knot winner, and a member of The Knot’s Hall of Fame. 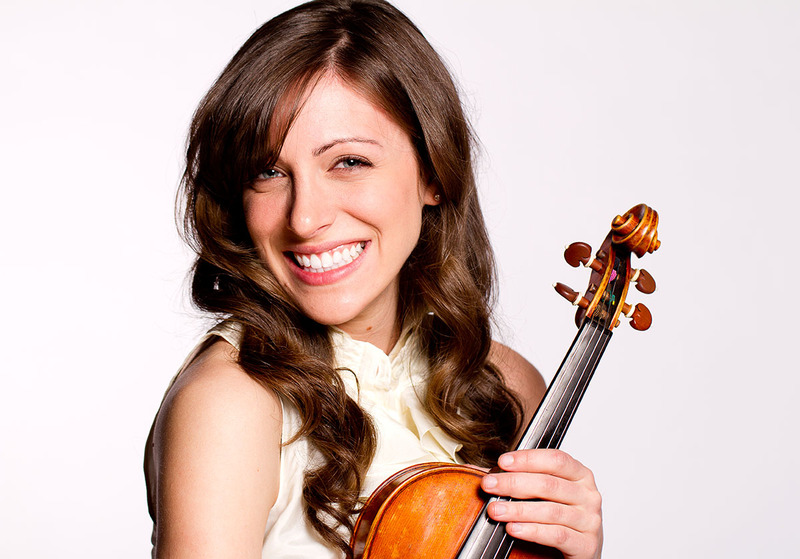 Miss Musique offers the highest-quality performances available for those seeking a string quartet Philadelphia.